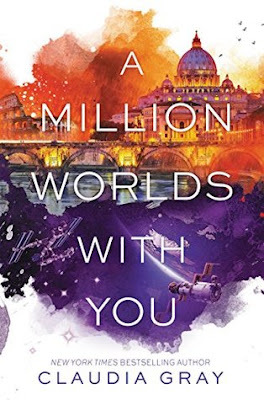 A Million Worlds with You is the third and final book in the Firebird series by Claudia Gray, and I’m so thrilled that I’ve finally read the book! The book has been sitting on my shelf for way too long, and I was absolutely determined to finish it before the year was over. I’m glad I finally had the opportunity to read it; it was a great conclusion to one of my most favorite series!! I read the first book in this series, A Thousand Pieces of You, way back when it was first released in 2014, and I immediately fell in love, not just with the story, which is awesome on its own, but with the characters as well. I love the main character, Marguerite, as well as her family and friends, and it was interesting to take this journey over the course of the three books with her. Also, her relationship with Paul is one of my all-time favorite romances. They are just too cute together, and though their relationship was far from perfect, they are still so good together, and I love them so much. The storyline for the series has been pretty awesome to read as well. I’ve never been much of a science-fiction reader, but I’ve read quite a few books in the genre lately and really enjoyed them. I think that’s one thing that held my interest so much while reading this series. I can’t say I’ve read many, if any, other books on multi-dimensional travel, and I was definitely hooked, and I definitely want to read more now. Overall; A Million Worlds with You was a great ending to a really great series! While I’m glad to have finally read the book, really hate to see the series come to an end. I know this is one series I will definitely be re-reading in the future, and I’m pretty excited to check out Claudia’s newest book as well, Defy the Stars, which was released earlier this year! If you haven’t yet checked out this series, I highly recommend you do so, and I hope you love it as much as I do!